Providing you the best range of laser cladding system with effective & timely delivery. We offer Laser Cladding system for cladding process. We offer complete Robotic turnkey project for Laser cladding which includes coating cell, Robotic gun manipulation, turntable and fume extractor with laser clading system. To cater to the changing needs of our clients, we offer a quality range of Laser Cladding System. The provided system is a fusion of the different material to a substrate surface with the minimum of melting of the substrate. It not only increases the wear resistance and corrosion resistance of metallic components but also impacts their performance. We ensure the stringent quality check of our products to deliver faultless product to our clients. Dilution with substrate material: variable with parameters but can be <5% gives a very pure coating with the desired coating properties. 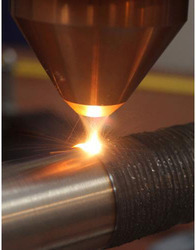 One of the major benefits associated with laser cladding is the ability to finely control the heat input to the substrate and the coating material. This allows the ability to deposit a two phase Metal Matrix Composite structure. In simple terms, the coating can have a softer, lower melting point material (the matrix) in which a harder wearing, higher melting point material (the hard phase) is suspended. The matrix material is typically a nickel based alloy. The fine control of the heat input allows the matrix to be completely melted, alloyed and bonded to the substrate surface, whilst at the same time, the carbide particles remain un-melted and are distributed evenly throughout the matrix. This is demonstrated in the adjacent coating section. This results in an extremely wear and impact resistant coating.